1. Deal with your past. Because of choices his family members made, Killmonger grew up without a father, in the hood. Worse, he KNEW that he had family out there somewhere, living a life way better than his, and had left him to face it alone. Understandably, he had a lot of bitterness and anger about that. So when he tried to make things better for his people, all that resentment was still there, driving his decisions. The scene where he kills his own girlfriend, his ride or die, in order to kill Klaue and get to Wakanda, shows this in a big way. He was willing to sacrifice her life in order to accomplish what he thought was best. He wanted to help black people around the world, but he didnâ€™t realize whatt he was destroying in order to do it. When he came to power, the unity that existed between the tribes of Wakanda was shattered, and civil war broke out. When we let our pain define us and drive our decisions, we end up destroying everything we touch. Even if you have great intentions, you donâ€™t have the discernment to go about it in a constructive way. When you get close to people, the pain you refuse to let go of will end up driving them away because you wonâ€™t know how to deal with stuff that triggers those memories. If you truly love your partner, youâ€™ll do what it takes to get healing and deal with your issues so that they donâ€™t end up dealing with you. 2. Your decisions donâ€™t just affect you. 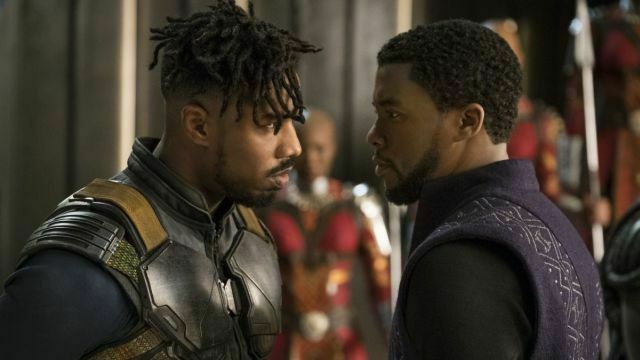 When Eric/Killmonger went to the ancestral plain to talk to his father, it broke my heart. His father said, â€œNo tears for me?â€� Eric replied, â€œEveryone dies, thatâ€™s just the way things are around here.â€� His father decided to stay in the hood and live off illegal activities in order to accomplish what he saw as Black liberation. But the Wakandan values of family were lost in exchange. His son had become desensitized and shut himself off emotionally. He had no empathy for others, no moral code. He became a man bent on revenge. Tears flowed down his fatherâ€™s face as he realized what he had sacrificed with his decisions, and the role he had played in his son becoming the man he was now. In my 4 years of parenting, I can honestly say that ALL of my habits show up in my kids, in some form or another. They donâ€™t just listen to what I say, they listen to what I DO. So thereâ€™s been a LOT of adjustment on my part as I realize that Iâ€™ve got some things in me that I need to change in order for my kids to be successful, productive, and happy people. If I react emotionally every time they do something wrong, they learn to go by their feelings when making decisions. Everything you do now becomes a legacy for your kids and future generations.